I have always enjoyed games, as long as I remember. When I was a kid, every independence and republic day dad’s company would allow us kids to go with them for the flag hoisting ceremony. What we kids actually looked forward to was going and playing games on the computers in dad’s office. 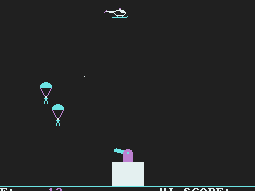 Paratrooper was the one I played then. I remember not wanting to leave – shooting those parachutes and watching those little pixely guys tumble to the gray/white earth..such simple fun! Then someone introduced Prince of Persia…Jaffer and the Mouse and the Princess…the fat guard who was a real good swordsman…those toothed killing traps…the cringe-inducing sounds effect when the prince was cut into two or fell on a pit full of spikes…the mirroe through which the prince lost his shadow…simple grayscale fun! But soon enough, I discovered Wolfenstein 3D and Doom, and gaming was never the same again. I have played so many awesome games since then, mostly FPSes. like Quake (all 4), the sequel to wolfenstein, Blood and RoTT in the old days….to Half Life (!) BioShock…but I couldnt really shake off the simplicity and plain, selfless, for-the-love-of-gaming fun that a platformer gives. So I always found myself returning to play games like BioMenace, Jazz Jackrabbit, Duke Nukem Manhattan Project (A guilty pleasure :P)…and recently I discovered a couple games which have made me all nostalgic again. The first one was Sword and Sworcery..unusual but fabulous art, BEAUTIFUL music, and the whole puzzle solving thing. A treat and such an easy, no-stress game to play. I love FPSes, but sometimes I find myself not wanting to play them, because of the stress I seem to feel when playing them. These simple, not-very difficult platformers are a perfect antidote to a bored and stressed mind. There was also Bastion…in-your-face fun with great music and lots of energy. But the one I loved the most recently? Braid! I have, since I played Jazz Jackrabbit, wanted games to have beautiful, fresh, pleasing game worlds. Braid has just that…beautifully painted bright worlds, pleasing music, and man the puzzles!! Puzzle solving has some sort of peace-giving ability I feel, or maybe its the satisfaction after solving a puzzle. I dont know, but I am playing thsi game as of now, and am loving it! Previous Article Get it off….